The issue around ports has been a hot topic of late. Recently I stumbled across some data about our ports which I found interesting so thought I would share. The data contains history of imports and exports from each port (sea and air) by both weight and dollar value. Note, this originally comes from Stats NZ and I’ve excluded a few ports as the numbers were so small they didn’t register on the graphs. This graph looks at the data by port for the last year. 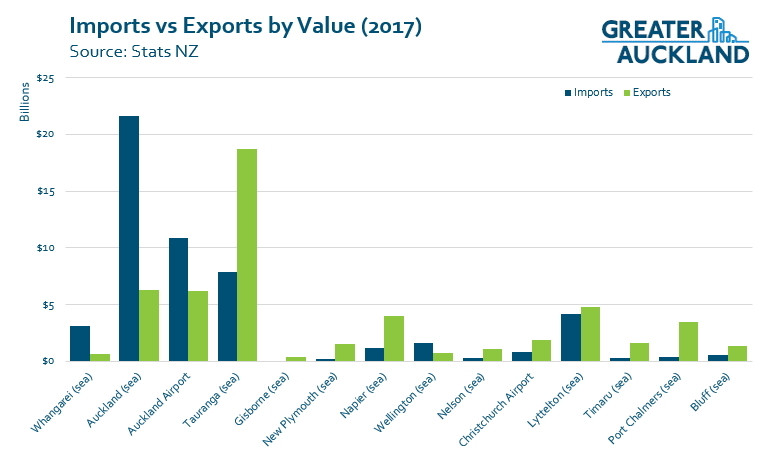 The first and most noticeable thing you can see that Tauranga absolutely dominates exports with it close to four times the next highest (New Plymouth). 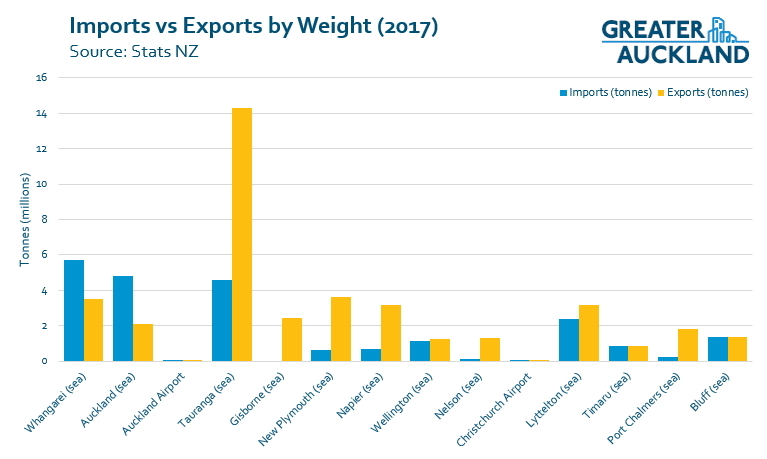 Ports of Auckland are quite far down that export list but are much stronger on imports where they’re only second to Whangarei with all the bulk fuel. Not all goods are the same though and many have high volumes of exports are exporting bulk goods like logs. As such, the value graph looks quite different. By total value of goods passing through them, the Ports of Auckland and Tauranga are very similar ($27.9b vs $26.5b). 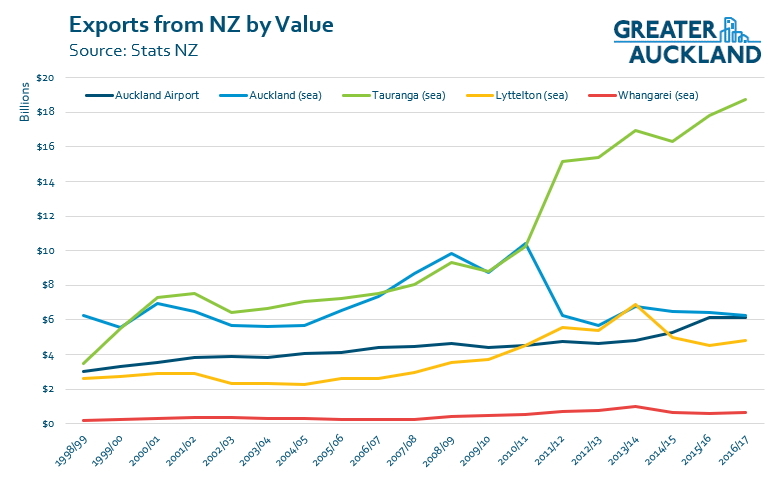 One huge mover in this space is the Auckland Airport which sees a lot higher value goods passing through. Given the data also contains a history of the values above, seeing how they’ve changed over time is interesting too. For these graphs I’ve picked the five biggest ports by dollar value. 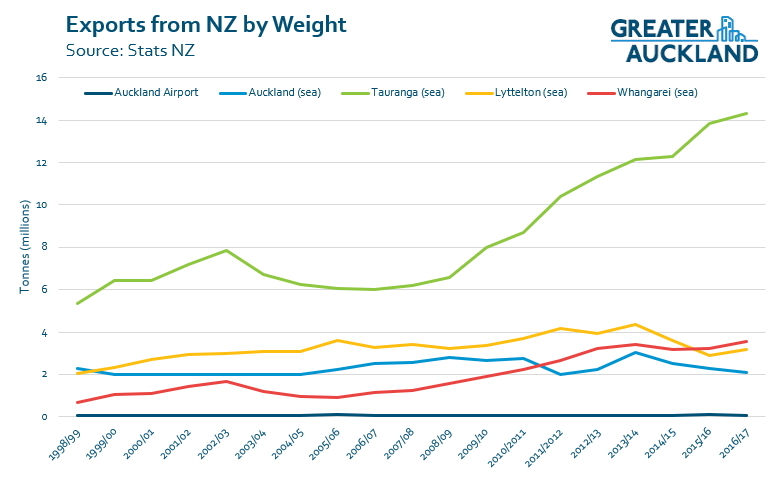 When looking at the change in volumes by weight you can see Tauranga clearly picking up in the early 2000s and Lyttleton picking up following the earthquakes. For exports again, I’ve used the same ports as above. 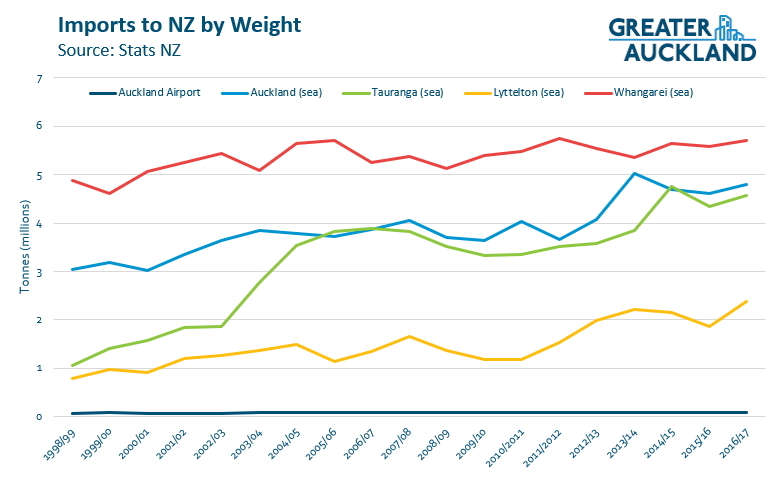 Tauranga stands out when looking at the change in exports by weight, having more than doubled in the last decade. Whangarei has also been increasing noticeably which will be a reflection of the logs being shipped from Northport. 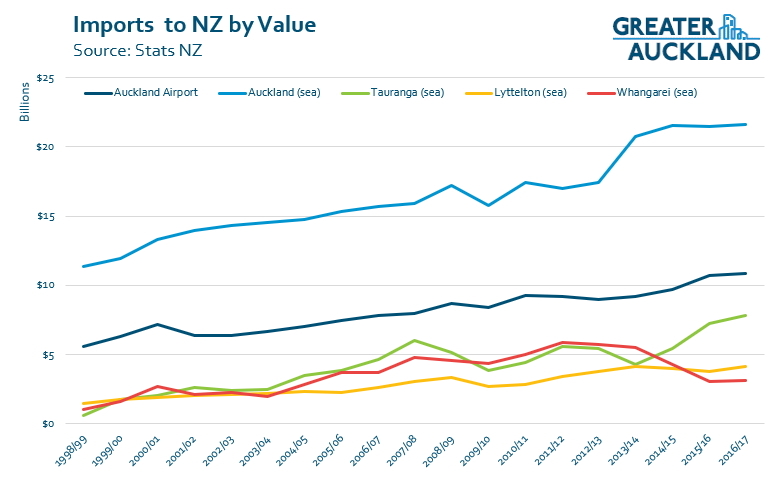 When looking at value, the particularly noticeable change is between ports of Auckland and Tauranga. That will likely be the result of Auckland losing a Maresk service as a result of industrial action at the time. Overall some interesting figures. What do you make of them? The first thing, but reflecting my own interest in aviation; the value of traffic going through Auckland Airport – exports and imports combined, more than any other seaport except Auckland and Tauranga. Most of this is ‘bellyhold’ (travelling in scheduled passenger services), rather than in dedicated air freight services. How much difference would the Kaikoura quakes have had on Wellingtons centreport? Next to no containers for 12 months. Likewise some of the logs trade went to Napier instead I believe. Thanks for this post. Showing detail by weight and value is interesting. The latter indicates who is doing their job well and the former points to where this website should interested in the transport implications. My first reaction is to buy port of Tauranga stock. Interesting stats. Looks to me like a great opportunity for Auckland. The port in Tauranga is located in the middle of the city. At some point Tauranga will face the same issues that Auckland is facing now, with prime city waterfront land (notably the container terminal site) being used intensively for industrial purposes, with no room to expand and with all the associated traffic volume. If Auckland Inc. can make the right decisions now about its port relocation/freight transport links (and labour relations??) and implement them in a timely fashion (not 40 years), shipping line customers will have the tempting opportunity to use a port offering safe & easy access for their largest ships (container ships in particular) envisaged over the next 50 years, with handy links to the industrial heartland of South Auckland and the wider Waikato/Bay of Plenty region. The second biggest export location by sea is actually Taharoa, on the West Coast of the North Island, from where nearly 4 million tonnes of ironsand is shipped each year. Data for Taharoa shows as 0 from 2015 and before that was 455 thousand tonnes. You have to wonder what the figures would look like if Marsden Point had a rail connection……. I probably wouldn’t buy POT shares. It’s too late now. POT made huge investment into catering for super freighters both in terms of dredging the harbour and expanding the port.This means that the super freighters ONLY stop in Tauraunga when they visit NZ. This was a huge coup for them over POA. They also pit small wharf unions against each other so there is less strike action which also contributes to them having a very efficient turnaround time in terms of loading/unloading cargo and waiting times for ships. POT is a well run port. POA is not very well run. Not sure what their debt structures are like though. POT could be up to it’s eyeballs in debt. Are air freight value numbers including or excluding the freight component? How much of the Auckland airport data is trans-shipments for other parts of NZ? Also via air? Are these just import/export volumes? Not internal shipments? Note: air freight volume is not always perishables. I think time urgent is a better characterisation. 1-2 weeks vs 4-5 weeks to/from China can be important. More so for destinations further away like Europe – say a replacement machine part or similar.